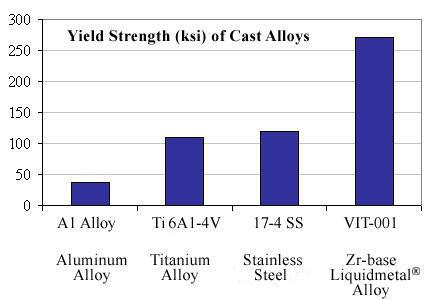 Apple has entered into an exclusive agreement to utilize amorphous metal alloys with unique atomic structures, allowing products that are stronger, lighter, and resistant to wear and corrosion, AppleInsider has learned. The metal alloys owned by Liquidmetal Technologies were developed by a research team at the California Institute of Technology, and their amorphous, non-crystalline structure makes them harder than alloys of titanium or aluminum. Introduced for commercial applications in 2003 through the Delaware-based Liquidmetal corporation, the product has been used to create technology for the U.S. Department of Defense, has been found in medical equipment, and is even used to create sporting goods like tennis raquets and golf clubs. In a Form 8-K filing with the U.S. Securities and Exchange Commission last week, Liquidmetal Technologies indicated that it had granted all of its intellectual property assets to Apple. According to the terms of the deal, Apple was awarded "a perpetual, worldwide, fully-paid, exclusive license to commercial such intellectual property in the field of electronic products in exchange for a license fee." Though the licensing agreement grants Apple exclusive use in consumer electronics, Liquidmetal is still allowed to license its products to other companies for any use outside of markets where Apple competes, meaning its deals with defense contractors, sports equipment manufacturers and medical suppliers are likely to remain intact. The agreement was made on Aug. 5, and was revealed to the SEC on Monday. It was signed by Larry Buffington, president and CEO of Liquidmetal Technologies. The company's official website gives examples of where Liquidmetal's products were used in portable electronics in the past. 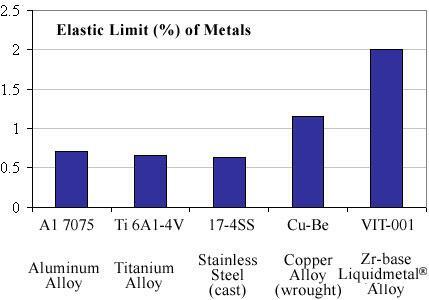 It touts that Liquidmetal alloys are 2.5 times the strength of commonly used titanium alloy and 1.5 times the hardness of stainless steel found in portable electronic devices. The technology is said to allow for thinner, smaller design while offering greater protection for internal components, and giving users a scratch and corrosion resistant exterior. "As the demand for product 'miniaturization' continues in the electronic casings industry, Liquidmetal alloys enable smaller, thinner and more durable designs," the company's website reads. "Current casings technology is pushed to the limit in supporting these new designs and specifications, especially requirements for larger LCD screens, thinner wall sections and pure metallic surface finishes for products such as mobile phones, PDA's and cameras." Past devices where Liquidmetal's technology was utilized include the Nokia Vertu smartphone, Sandisk Sansa media player, and Sandisk U3 Smart thumb drives. The product was also used to create strong hinge components for devices like flip smartphones. Apple's interest in a company like Liquidmetal is no surprise, given its constant desire to create smaller and thinner devices. Apple has also employed a unibody design in its portable computers, beginning in early 2008 with the MacBook Air. The precision unibody enclosures are milled from a single extruded block of aluminum, allowing devices like the MacBook Pro to become thinner while maintaining a rigid, sturdy frame. Previously, the frames of Apple's notebooks were made from multiple parts. Now, raw aluminum is carved out using CNC, or "computer numerical control" machines.